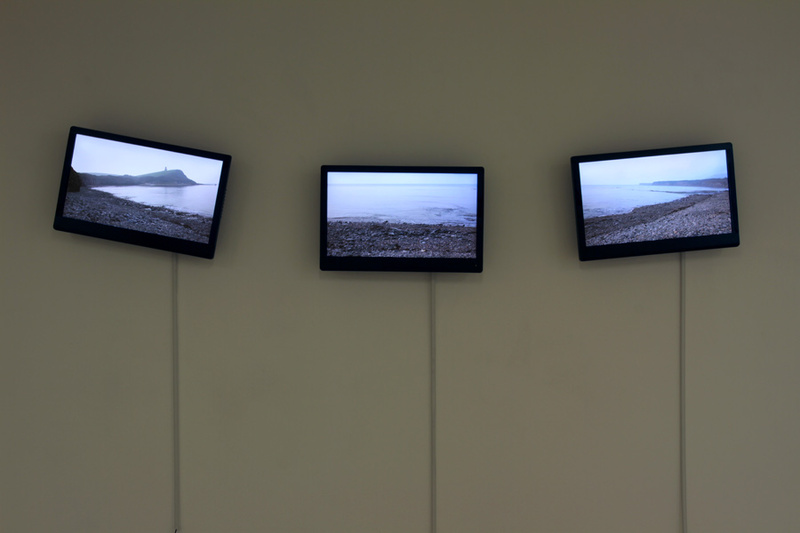 For the multi-screen video installations such as Redend Point (2011-12), Kimmeridge (2011-12) and Tilbury (2012-13) Martin Newth has made use of the small openings in the concrete walls of World War II defensive structures commonly known as pillboxes. Pillboxes were built all over Great Britain during the Second World War but because the UK mainland was never invaded the structures were never used for the purpose for which they were built. Instead the small buildings remain as relics of a war that took place elsewhere, standing watch over the British landscape. 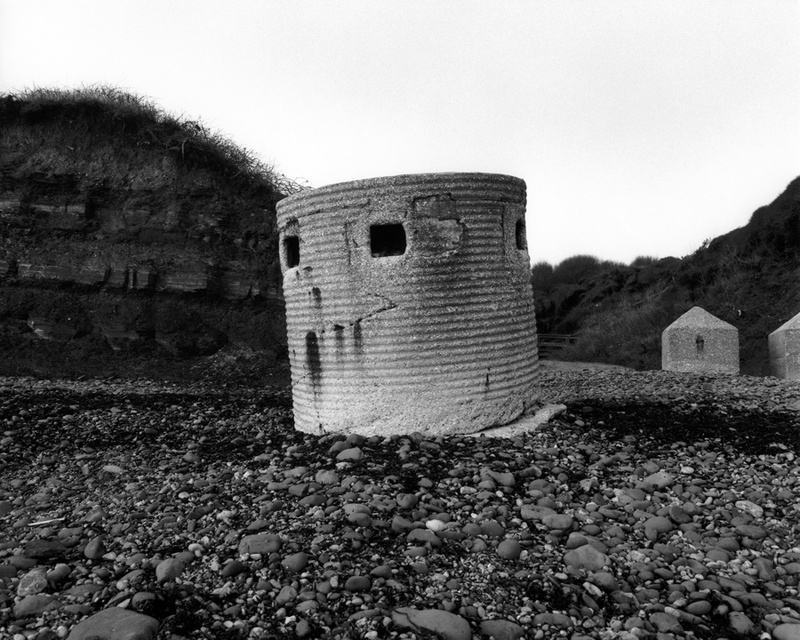 The pillbox used to create the installation included in the Troubled Waters exhibition at the Kuandu Museum of Fine Arts in Taipei, Taiwan, 2013, and previously at theGallery at The Arts University College Bournemouth, is located on the Dorset coast in southern England. Here, forces of coastal erosion have undermined the structure causing it to be slowly engulfed by the sea. 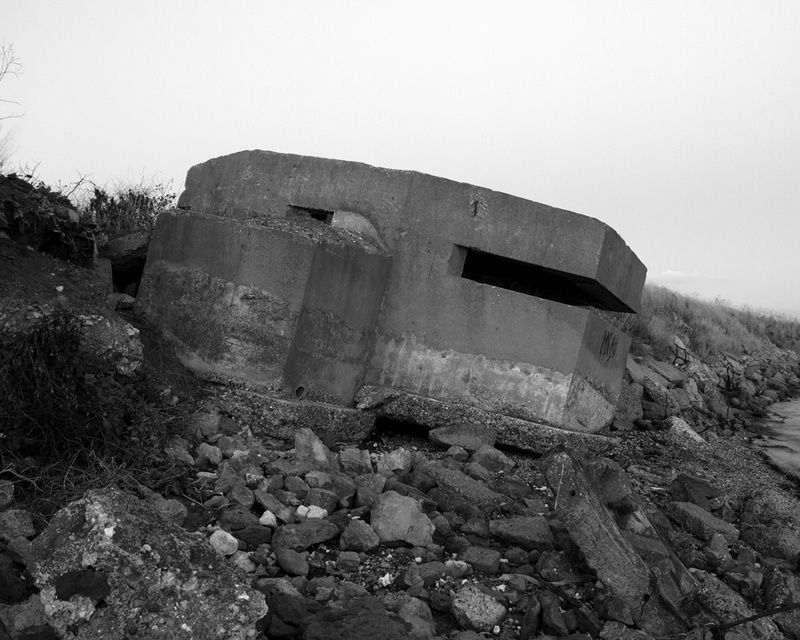 To create the three-screen, moving panorama video cameras are positioned at the pillbox’s embrasures, thereby replacing the intended position of a gun with a camera. 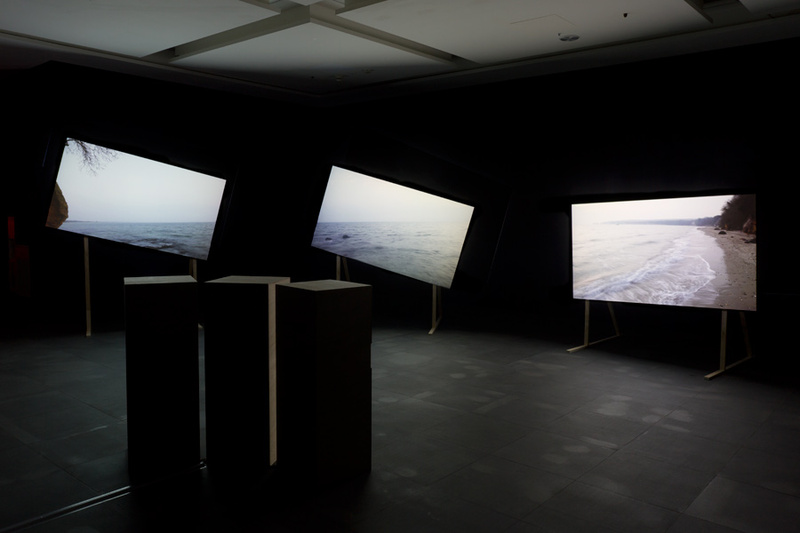 The three separate screens are reoriented to the flatness of the horizon, echoing the tilt of the structure. 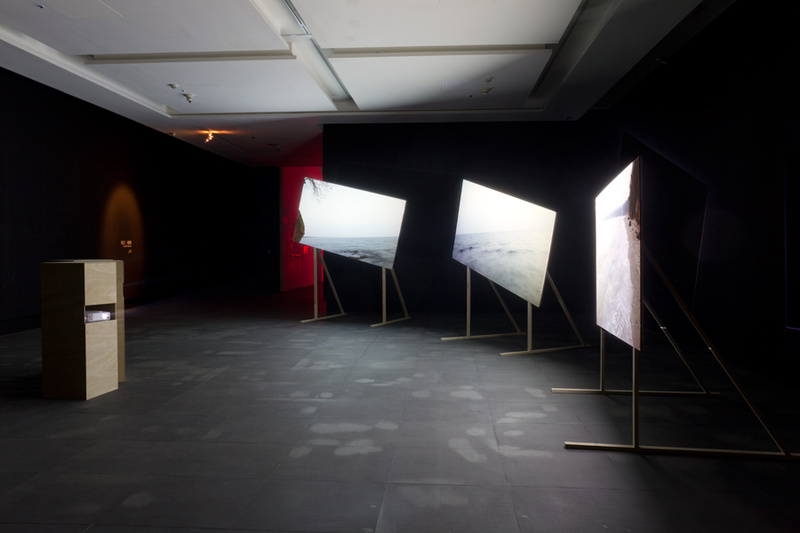 Each screen shows the waves approaching the structure from each view’s angle of attack. There is no direct sign of the structure in the images. The intention is that the viewer might consider the persistent rhythm of the sea set against the imagined, imperceptibly slow movement of the architectural structure, which, undermined by exactly that relentless motion of the waves, makes its slow-motion dive into the sea. 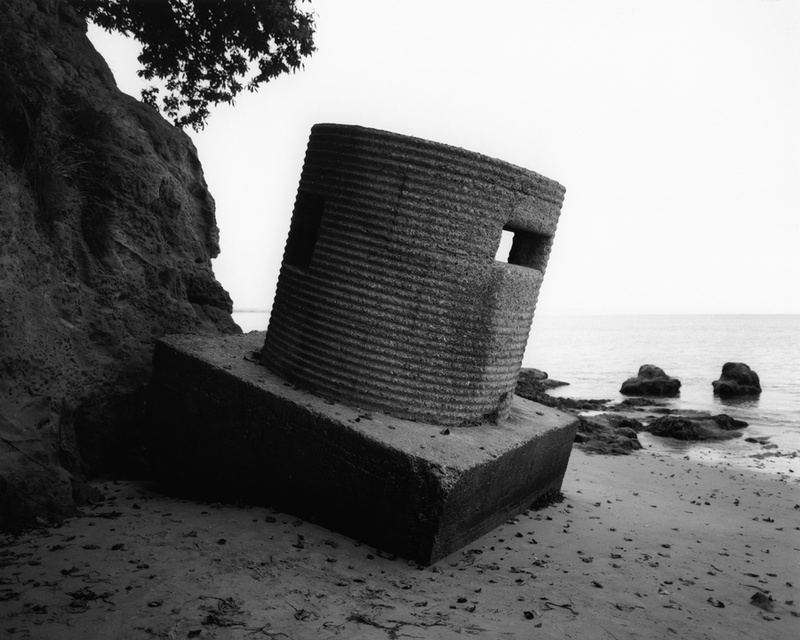 The viewer is invited to consider the change in what the pillboxes signify. Once these peculiar little structures were indicators of a united stand in defence of imminent enemy invasion; now they may be seen to signify the contemporary threat of rising sea levels, the encroachment of the sea caused by climate change and the impending ecological crisis. Redend Point, 2011. 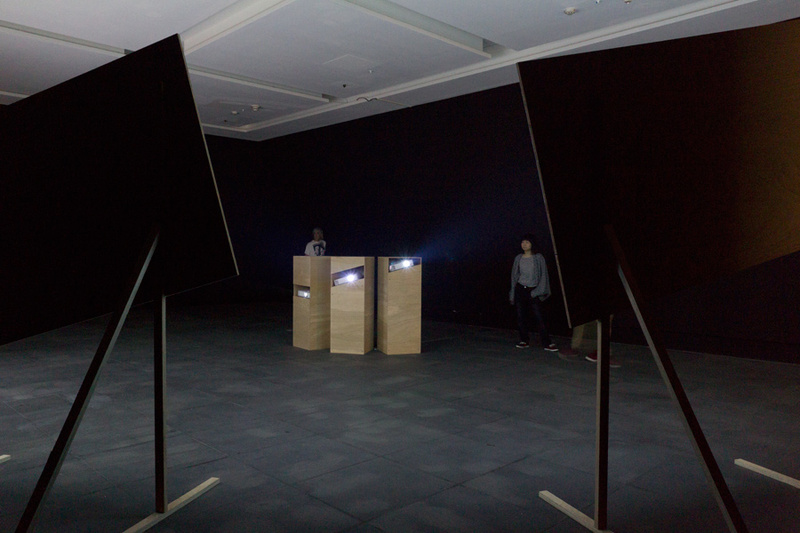 3 single channel HD video projection. Tilbury, 2012, 3 Channel HD Video. Pillbox on Thames at Tilbury.